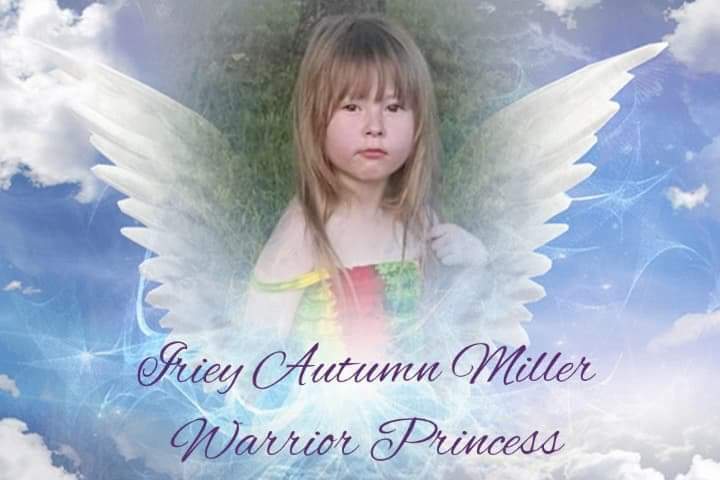 Iriey Autumn Miller passed away on January 21, 2019 in Trinidad, Colorado. Iriey was born on February 9, 2011 to her parents, Shane Thomas Miller and Danyelle Nichole Thrasher-Miller in Fort Worth, Texas. Iriey was a warrior from birth. She was a modern-day martyr for Dravet Syndrome Awareness. She was the meaning of perseverance. She awoke every day happier than the last. Failure to thrive wasn’t in her vocabulary. Iriey taught so many people the definition of true unconditional selfless love. She loved music, hats, glasses, smiling, food, laughing, screaming, pulling hair, toys, swimming, mirrors, Mommy, Daddy, Bubbus and Blue. Iriey is preceded in death by her PeePaw, Michael Thrasher; her Uncle Bubba, Billy Dobbs Jr.; and her Ol’ Grandma, Patty Thomas.